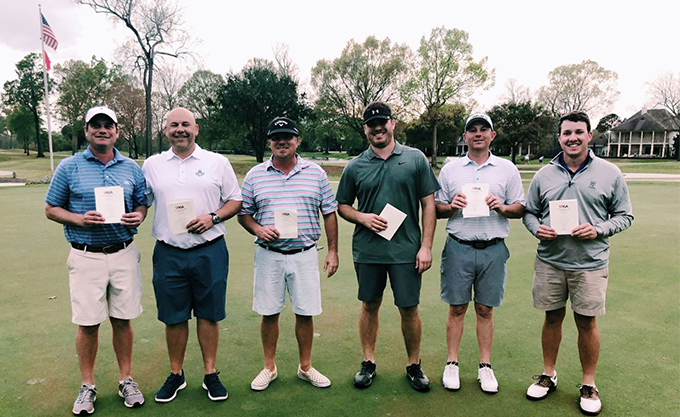 It was a memorable day at the Country Club of Louisiana where the Louisiana Golf Association conducted Sectional Qualifiers for the U.S. Amateur Four-Ball and U.S. Women’s Amateur Four-Ball Championships. Abbey and Kay Daniel of Covington, Louisiana carded a two-under-par 70 to earn medalist honors in their respective qualifier. The Daniels now advance to the championship proper, to be conducted at the Timuquana Country Club in Jacksonville, Florida, April 27-May 1. On the men’s side, four teams punched their ticket to the 5th U.S. Amateur Four-Ball, which will be held at Bandon Dunes Golf Resort in Bandon, Oregon, May 25-29. Greg Berthelot of Baton Rouge and Kyle Williams of Choudrant took medalist honors after firing an eight-under-par 64. Louisianans dominated the men’s sectional qualifier for a “clean sweep” of all four qualifying spots, and the Bayou State will be well represented at Bandon Dunes. Six-under par 66 was the number that placed three teams in a tie for 2nd, locking in the final qualifying spots. Also qualifying are: Michael Anderson and Max Sellers of Baton Rouge, James Fuselier of Laplace and Andrew Noto of Metairie, and John Faulk and Matt Nicholas of Lake Charles. These sectional qualifiers were a tremendous showcase of golf in Louisiana. 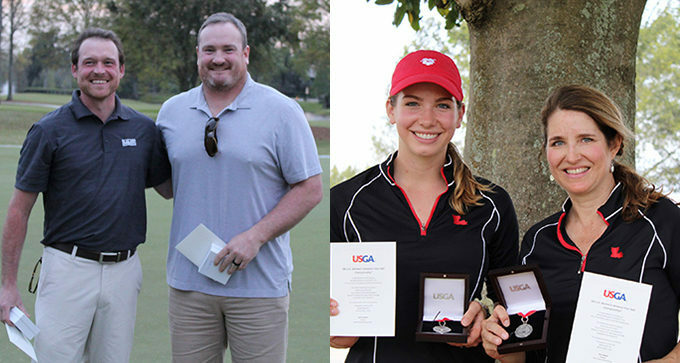 The talented players competing on one of the state’s premier courses was a treat to watch. Anderson/Sellers and Fuselier/Noto posted their 66 in the morning wave, and it was a waiting game to see if that would be good enough to advance. Faulk and Nicholas were the penultimate group in the afternoon wave, and they qualified in dramatic fashion after Faulk drained a 15-foot birdie putt on the 18th hole (pictured right). First Alternates are Mason Seaborn of Montrose, Alabama and John Wright of Fairhope, Alabama. Second Alternates are Joel Myrick and Ben Snow of Hattiesburg, Mississippi. Berthelot and Williams will be a storyline to watch in Oregon. Berthelot is a former LGA Amateur Champion. Williams recently retired from the NFL after a storied 13-year career with the Buffalo Bills. He was a consummate professional and earned six trips to the Pro Bowl. Berthelot and Williams are an incredible Four-Ball team with an established rapport and excellent chemistry. They won the 2011 LGA Four-Ball Championship after posting consecutive rounds of 63 at Koasati Pines at Coushatta. Berthelot, a former LGA Amateur Champion, got the team off to a hot start on Monday. They were three-under par through their first two holes without a single statistical putt. Berthelot holed out from a greenside bunker for birdie at the par 4 1st hole, and then he made an eagle putt from just off the green at the par 5 2nd hole. Berthelot added a birdie at the par 5 5th hole, and Williams contributed a birdie at the par 3 6th. They tacked on three consecutive pars to make the turn at five-under par 31. The team’s next birdie came from Williams at the par 5 11th hole. Berthelot added back-to-back birdies on holes 14 and 15, and they coasted in with three straight pars, bringing their back nine total to three-under par 33. If Berthelot and Williams are able to make it to match play at Bandon Dunes, their ability to make hordes of birdies bodes well for them to make a deep run. On the women’s side, Team Daniel has all the tangibles to make some noise at Timuquana Country Club. This will be the mother/daughter duo’s second time competing in the U.S. Women’s Amateur Four-Ball together, having also qualified in 2017. Kay will be competing in her twenty-first USGA Championship, while her daughter Abbey will be competing in her seventh USGA Championship. Abbey, the reigning Louisiana Women’s Amateur Champion, will follow in her mother’s footsteps and play college golf at Mississippi State this fall. The younger Daniel has developed an impressive resume with respect to Four-Ball Championship qualifying. She previously qualified for this event in 2016 with Julia Johnson before teaming with her mother to qualify in the 2017 edition. Last year Abbey qualified with her future Mississippi State teammate Ashley Gilliam. Monday’s round was a grind for the Daniels, and they were able to capitalize on their birdie opportunities while limiting any major mistakes. Kay contributed two birdies on the front nine at the par 5 2nd hole and the par 4 9th hole, but the team bogeyed holes #4 (par 4/380 yards) and #7 (par 4/320 yards), and they made the turn at even par 36. Kay added another birdie at the par 5 11th hole, and Abbey birdied the par 3 17th. Kay secured the lone qualifying spot with a par at the par 4 18th. The Daniels edged out First Alternates Dana Clary and Morgan Miller of Cedar Park, Texas by one stroke. Clary and Miller were the only other women’s team to finish under par on Monday. Second Alternates are Courtney Battieste and Nitisha Manikandesh of Plano, Texas. As previously mentioned, the LGA conducted the U.S. Amateur Four-Ball Qualifiers on behalf of the USGA, and this was the largest qualifying site in the country. The Jack Nicklaus designed Country Club of Louisiana golf course played to a par 72 at 7,000 yards for the men and 5,900 yards for the women. The weather in Baton Rouge on Monday was partly cloudy with temperatures reaching the upper 70s with a slight breeze. Superintendent Ed Pippin and his crew did a phenomenal job getting the course in championship condition, and it drew rave reviews from this field of the top amateur golfers in the region. The Country Club of Louisiana will host the LGA Women’s Amateur this June. For final scoring results, click here.